"<interdict> / <simulate> / <worship> [...] <observe> ! <imitate> ! <usurp> [...] <unknown> / <enigma> / <shortfall> / <abort> ! <halt> ! <abort>"
Quria, Blade Transform is a Vex Axis Mind Hydra who was manifested by the Vex in order to understand and conquer Oryx's realm, and the sword logic within it. It is now a powerful Taken commander under Savathûn, the Witch-Queen, having mastered the power to Take through its simulations of Oryx..
"Simulate me, wretch. Calculate the permutations of my divinity. Compute the death in the shape of my throne. Render my shadow on the stone of ten thousand graveyard worlds! It will never be enough. I hold the Tablets of Ruin. I speak to the Deep. Not with a galaxy of thinking matter could you encompass me. Behold!" The Vex first encountered the Hive when Crota, Son of Oryx used his sword to cut open a portal to another region of space, in the hopes of gaining a secret power. Savathûn had tricked Crota into choosing that location; the region Crota accessed contained Vex, who were able to enter the Ascendant Realm of Oryx directly. 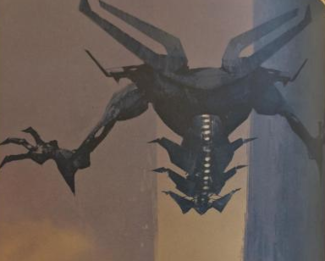 Initially, the Vex were perplexed by the unique physics of the realm, physics of Oryx's own creation designed to allow the strongest entities within it to rule and attain divine power, i.e. sword-logic. Seeking a solution, the Vex manifested a new Axis Mind, Quria, Blade Transform, who was able to unravel the enigma of sword-logic and thereby allow the Vex to adapt to Oryx's ascendant realm. Quria's solution was simple: in order to gain power in the realm, the Vex needed to kill everything within it. Soon the Vex were manufacturing powerful new models specialized for combat, which wreaked havoc among the Hive and consequently became even stronger. Oryx's children Crota, Ir Anûk, and Ir Halak, destroyed many Vex using an Annihilator Totem, but were unable to seal the portal to Vex space shut before Quria built a device to hold it open. For a century, a stalemate between Vex and Hive endured; neither race could leave their origin space to attack the other without becoming too weak to inflict any lasting damage. Eventually, Quria captured Worm larvae for experimentation and discovered that worshiping the Worms allowed the worshiper to alter reality slightly. As a result, it created a Vex priesthood to worship the Worms, and then began capturing and killing increasingly dangerous organisms to bootstrap itself to divinity in accordance with Hive sword-logic. For unknown reasons, Quria refrained from integrating a Worm with Vex mind fluid. Summoned home by the Worm God Eir, Oryx cleared his realm of Vex, defeating Quria's limited tactics and forcing the Mind to retreat for a time. Quria did not attack the Hive again until Oryx had built his Dreadnaught and used it to destroy the Harmonious Fleet Invincible and raid the Nicha Thought-ship. As Oryx boarded the ship, Quria ambushed him in force. Upon attempting to simulate and understand Oryx, however, Quria was stymied, as Oryx had become too complex and powerful for even the Vex to fully comprehend. Quria realized that it could not overcome Oryx and faced certain defeat. As Oryx and his forces cut through the Vex, Quria resorted to making a partial simulation of Oryx that encompassed only his original form, Aurash, as Quria could not accurately measure Oryx's current form and power. Quria projected the simulation of Aurash at Oryx to gain any insight it could. Fascinated, Oryx briefly spoke with the simulated Aurash, and Quria contextualized their dialog with a Taox-simulation retrieved from a gate in former Ecumene space. Quria's last act before Oryx took it was to send the information it had gathered to the rest of the Vex network, knowing the other Vex would devote their resources to finding a solution to the Hive. Afterwards, Oryx gifted the Taken Quria to Savathûn so she could study it, explaining how it had simulated Aurash. To this end, he'd left Quria with a modicum of free will so that it might simulate further surprises for her. After the Red War, Taken forces led by Ir Arok, Tongue of Quria and others titled after Quria appeared on Io, and attempted to subvert the Vex Collective Mind. They were stopped by the Guardian. According to Toland, the Shattered, who was encountered by the Guardian within the Ascendant Realm while exploring the Dreaming City, Quria has obtained the power to Take; its powers of simulation have apparently been enhanced as a result of its Taken status, allowing it to successfully simulate Oryx in his entirety and thereby learn how to Take for itself. This essentially confirms that the Taking of Vex witnessed on Io by the Guardian was performed by Quria itself. Upon the death of Riven, the last Ahamkara, Quria's mastery of simulations traps the Dreaming City in a never-ending 3 week cycle along with a Taken curse by Dûl Incaru, the Eternal Return; the cycle of the curse was able to affect the whole City with the fidelity of a Vex simulation as a result of Riven feeding upon the Guardians' collective wish to save the city. Sometime later, Quria apparently traps The Guardian and Medusa in a Vex simulation. It begins to fully explain the plans of Savathûn and that it had achieved the Vex's desire to simulate the Light. However, the simulation then proceeds to seemingly collapse on itself due to it being an illusion by Dûl Incaru. In spite of this, the process reverses itself until the role of the narrator eventually reaches Eris Morn a second time. Because of this, it is unclear whether or not the real Quria had ever appeared to the Guardian at all. Quria might be derived from the Greek Kyría (κυρία), which translates to "lady". Related Kýrios (Κύριος) means Lord, and is a common title for Jesus Christ of Christianity. It may also be a portmanteau of "Query" (A question) and "Curia". (A group of institutions within the Roman Catholic church) Quria was created to answer a question, and its answer was to mimic the religious behaviour of the Hive. Quria is the second known Taken in destiny to retain at least partial control of her will, after Malok and before Riven, of a Thousand Voices. In the same lore entries that describe the (supposed) first contact between it and The Guardian, the Vex simulation includes a facsimile of Master Rahool decrypting the vessel of Medusa into a Shader, two generic tokens, and a non-descript rare-quality item. Though this is a reference to the meme "two tokens and a blue" in the Destiny community, it also raises the possibility that Quria has personally monitored the Guardian for an unknown period of time. Quria bears an incredibly strong resemblance to Panoptes, Infinite Mind. This implies they are the same type of Vex unit. Quria is also the second Hydra with arms and hands the first being Panoptes, Infinite Mind.